Once winter hits….my crockpot, madame crock of the pot, comes out. I don’t know why I don’t use her more often in the summer, but DANG she is handy. She is the queen of easy meals, hence why I call her madame because she seriously deserves it. Every time I pull her out of my cabinet, I feel like an old friend has come back to visit. She makes me feel all warm inside, filling my house with awesome smelling goodness. I love coming home from work to an easy already prepared dinner. Thank you madame crock o’ the pot. I recently used it to easily cook a whole chicken. The spices can vary in this recipe. I prefer a flavor that isn’t too overpowering so that I can shred the chicken and use it in other dishes. For this recipe, I simply used a whole lemon with some fresh rosemary sprigs, but feel free to throw in whatever you fancy. Wash and pat dry chicken, inside and out. Remove skin (if you have time). Place in crockpot. Squeeze lemon quarters and sprinkle juice over lemon. 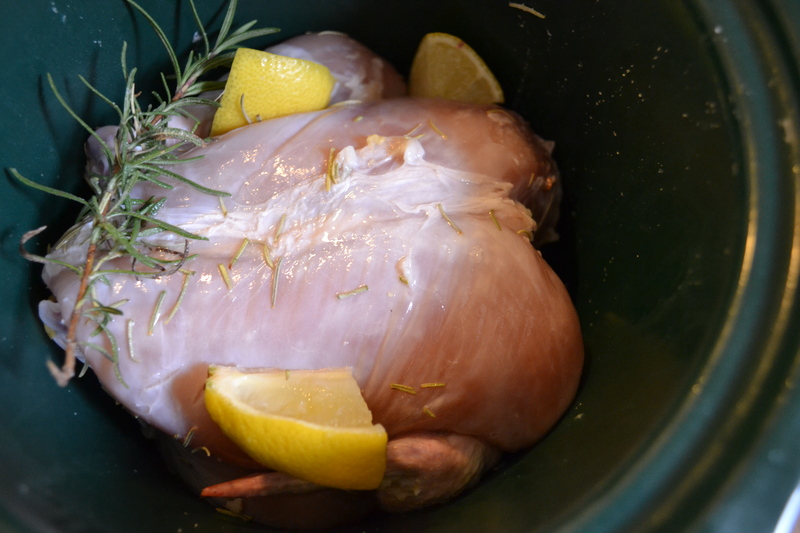 Place lemon and rosemary around chicken. Apply salt and pepper liberally. Turn crockpot on low and cook for 8 hours. 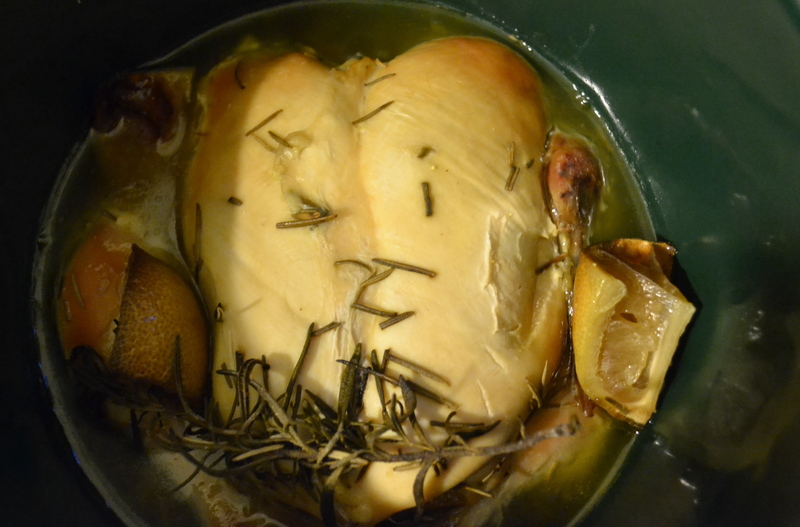 Note: Once you debone your chicken, save the carcass to make your own chicken stock. I place the carcass (no skin or fat) back into the crockpot along with some celery, a carrot, about 10 whole peppercorn seeds, an onion, and garlic. Fill the crockpot to cover the carcass and veggies by about 2 to 3 inches. Cook on low overnight. In the morning, turn off the heat and allow the chicken broth to cool. Skim off any fat. I freeze this broth in batches so that I can use it later in other soups.